These can be defined as bogs which form from vegetation that grows due to the nutrients present in rain water. When fen peatlands formed and their depth increased to the level where the surface vegetation could no longer be influenced by mineral rich ground waters or surface waters, the type of vegetation changed to plant species which grew and tolerated the low nutrient conditions present in rainwaters. The plant species that grew and were dominant under these changed conditions were Sphagnum mosses but initially bog cotton was also common. The Raised Bog peats formed when the Sphagnum mosses partially decayed and accumulated in annual cycles over hundreds or thousands of years in the anaerobic water­logged environment. Sphagnum mosses are very important in the formation of Raised Bogs as they act very much like a sponge in that they draw up and hold water as they grow. They have the unique property of being able to hold up to 20 times their own weight of water in their pores and cells. The Raised Bog peats that form from Sphagnum mosses can be subdivided into two categories: older Sphagnum peat which contains some bog cotton remains and is well humified (i.e. is well decomposed) forms immediately on top of the fen and has an average depth of 2.5m. Younger Sphagnum peat contains little or no bog cotton, is of more recent origin and is relatively unhumified. It forms on top of the older Sphagnum peat layer and its upper surface supports fresh vegetation at the present time. Its average depth is 2.5 m. Hence Raised Bog peat (i.e. older and younger Sphagnum peats) are a total of about 5.0 m deep over the underlying fen. 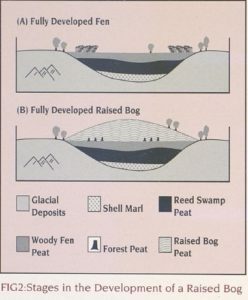 They are distinguishable from other peat types by the (almost complete) absence of any tree remains within their layers. Rainfall is an important factor in the growth of a Raised Bog as Sphagnum mosses flourish in areas where rainfall is between 700 mm and 1000 mm and the number of rain days is between 150 and 175 per annum. Raised Bogs derive their name from the fact that the top surface of a mature undrained bog is raised many metres above the level of the local landscape. Close examination of the top surface of a Raised Bog will reveal a very uneven pattern of hummocks, hollows and pools; the hummocks are raised above and are marginally drier than the hollows. The dominant plant species on the bog surface are Sphagnum mosses where different Sphagna grow on the high hummocks in contrast to those which inhabit the lower hollows. Sphagnum mosses with their unique property of being able to hold up to twenty times their own weight of water, in their pores and cells, are believed to be the chief building blocks of Raised Bogs, in that they draw the water-table of the bog system upwards as they grow. They are therefore mainly responsible for the very deep specimens of Raised Bogs which we have in the midlands of Ireland. Sphagnum mosses were used in surgical dressings in World War I as they possess disinfectant properties due to the presence of Phenols. The deepest Raised Bogs are in Kildare and Offaly where a survey of depth from the top surface to the underlying mineral sub-soil was found to be 13.5 metres. Raised Bogs are unique habitats where certain plants and communities (eg. Sphagnum mosses, Bog cotton, Ling heather, Sundew, etc.) have adopted to the acidic waterlogged environment. The Sundew is a very complex plant as it supplements its low nutrients intake from the peatland soil by capturing and absorbing insects, it is thus defined as aninsectivorous plant. It produces a sticky substance on its surface which both attracts and traps insects and it also secretes chemicals which digest the insects. Hence, some of the major elements (i.e. Nitrogen, Phosphorous and Potassium) necessary for the growth of the Sundew are derived from the trapped insects. Raised Bogs used for Horticultural Products – Moss peats used in horticulture are mainly the younger Sphagnum mosses which are found in the uppermost ca 2.5 m of a Raised Bog; these, relatively young peats, were laid down during the past ca 2500 years. They have outstanding absorbancy properties and are used as soil conditioners where they supply large quantities of air and water to the roots of plants. When these moss peats are fertilised they are known as composts which are excellent growing media for a great variety of plants; each compost is manufactured to specific crop requirements by adding exact amounts of lime, major and trace elements to moss peat. Raised Bogs used as sources of fuel – The most suitable peat for use as fuels are found in the middle and lower strata of Raised Bogs. In general, the older the peat the higher the heating value or calorific value of the peat. Milled peat produced by Bord na Móna is supplied to the ESB for electricity generation and is also supplied to briquette factories as raw material for briquette manufacture. Sod peat is also produced from Raised Bogs for use as a domestic fuel. Sphagnum Mosses, Bog Cotton, Bog Rosemary, Bog Asphodel, Cranberry, Ling Heather, Cross-leaved Heath, Deer sedge, Sundew, Cladonia Lichen, Bog Orchid. Cranefly, Damselfly, Dragonfly, Emperor Moth, Black Slug, Common Frog, Hare, Red Grouse, Curlew, Snipe, Meadow Pipit, Skylark, Kestrel, Hooded Crow. 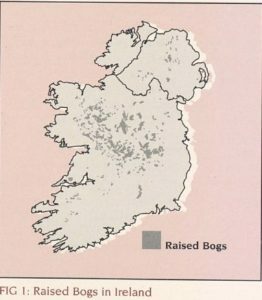 The Raised bogs which are located mainly in the midlands of Ireland are unique environments as most of these bogs have been cut away in other European countries.Because of their uniqueness and the fact that they have taken approx. 9000 years to grow to their present level of maturity, it is extremely important that some of the remaining undrained prime specimens should be conserved for posterity. Raised bogs provide a wide range of subjects for research purposes. Subjects such as flora, fauna, ecology etc. can be studied. Horticulture UseRaised bog, young peats, (i.e. Sphagnum mosses) from the upper stratum of a raised bog, have excellent properties when used in horticulture.Moss Peats are excellent soil conditioners where they supply water and air to soils.Moss peats when fertilised (i.e. composts) are excellent growing media for a wide variety of plants. Peat Pots. These are manufactured from moss peat mixed with paper and with fertilisers added. Raised bogs used for fuel utilisation (i.e. from the lower strata)Milled Peat. This is an air~dried product which is supplied to power stations for electricity generation. Milled peat is also supplied to briquette factories where it is artificially dried to form peat briquettes.Sod Peat. This product can be produced from Raised Bogs and used as a domestic fuel.